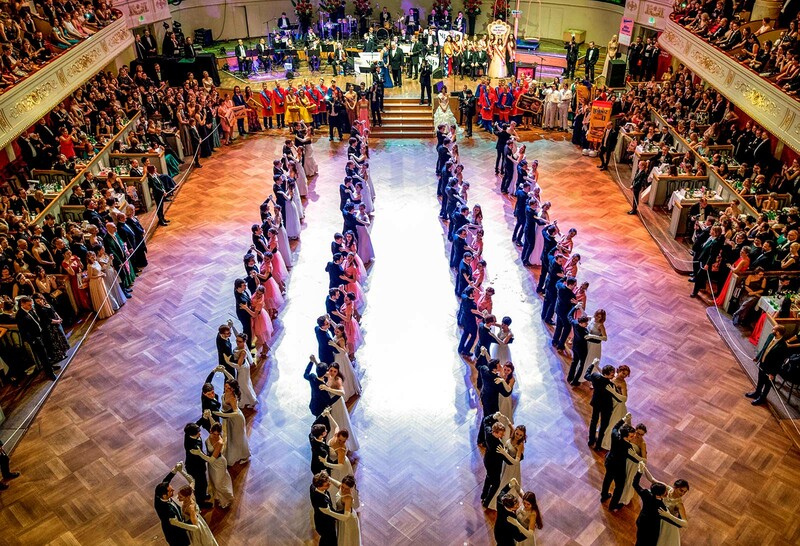 Dancers attend the 'BonbonBall' in Vienna, Austria, February 2018. Vienna has retained its first-place status on the Mercer Quality of Living survey for the 9th year in a row. 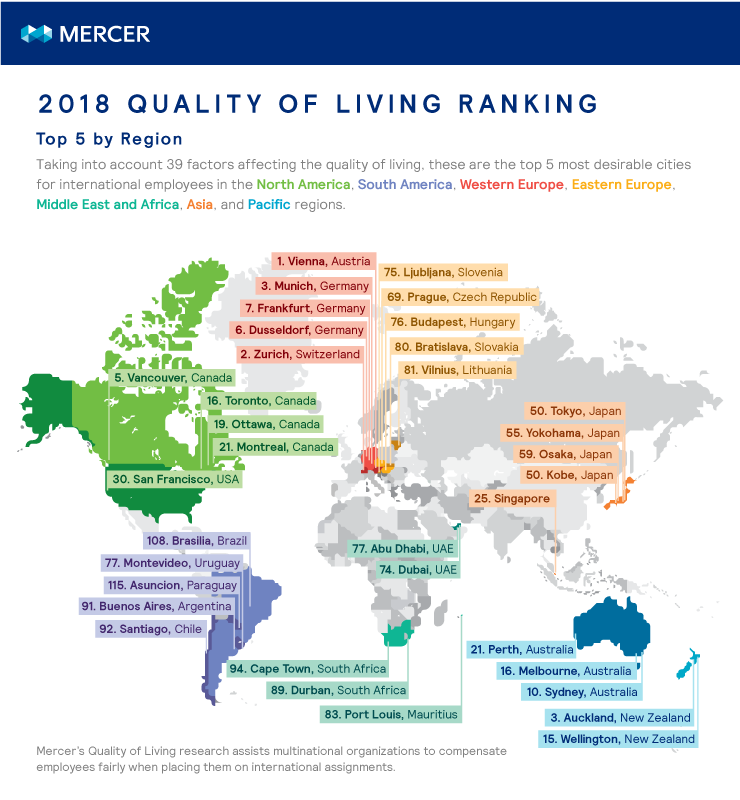 European cities dominate the 2018 Mercer Quality of Living City Survey. Three of the top five cities on the list are in Europe—Vienna, Zurich and Munich—with Auckland and Vancouver making up the remaining two. Vienna retained its first-place status for the ninth year in a row. The top cities in Asia and Latin America—Singapore and Montevideo—rank 25th and 77th. The survey is conducted annually by Mercer to enable multinational companies and other organizations to compensate employees fairly when placing them on international assignments. 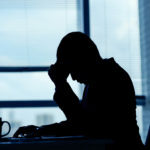 In addition to data on relative quality of living, the survey contains hardship premium recommendations for more than 450 cities throughout the world. A number of factors—ranging from political stability to the availability of food and consumer goods—determine quality of living in a modern city. 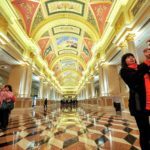 Although cities in emerging markets have invested heavily in infrastructure and accommodations to attract foreign talent and business, Western cities remain dominant in terms of quality of life. Over the past half-decade, a rash of global geopolitical events has exposed a slow drift toward nationalism, tribalism, and economic protectionism. 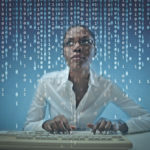 Nevertheless, globalization still continues apace, requiring companies to be ready to attract the most talented global workers through attractive living standards. Despite lingering uncertainty about the state of the European Union in the wake of Brexit, a wide range of European cities appears at the top of the Mercer ranking. Switzerland and Germany share six cities in the top 10: Zurich (2), Munich (3), Dusseldorf (6), Frankfurt (7), Geneva (8), and Basel (10). 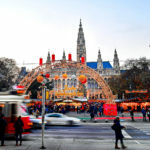 Munich jumped to 3rd place from 4th in Mercer’s 2017 survey on account of “a concerted effort to attract talent and businesses by continuously investing in high-tech infrastructure and promoting its cultural facilities,” according to the ranking. In North America, Canadian cities largely outrank cities in the U.S. Four Canadian cities—Vancouver (5), Toronto (16), Ottawa (19), and Montreal (21)—made the list above. San Francisco (30) is the United States’ highest-ranked city, followed by Boston (35), Honolulu (36), Seattle (44), and New York (45). Increasing crime rates caused Los Angeles (64) to drop six places. In the Middle East, Dubai (74) continues to rank highest for quality of living, closely followed by Abu Dhabi (77), which climbed up two places. Only four other cities in the region made the top 100, including Muscat (70), Tel Aviv (87), Manama (93), and Kuwait City (99). In Asia, Singapore remains the highest ranking city in 25th place. Five Japanese cities performed well: Tokyo (50), Kobe (50), Yokohama (55), Osaka (59), and Nagoya (64). Other notable cities in Asia include Hong Kong (71), Seoul (79), Taipei (84), Shanghai (103), and Beijing (119). 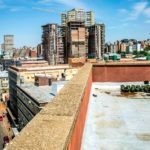 Issues including political instability, poverty, and extreme climate pushed a number of cities across the Middle East, Africa, and South America to the bottom of the rankings. Damascus (225), Sana’a (229) and Baghdad (231) are the three lowest ranked cities in the Middle East, with Baghdad occupying last place on the list at large. Bangui (230) and Port-au-Prince (228) are the lowest-ranked cities in Africa and South America, respectively. 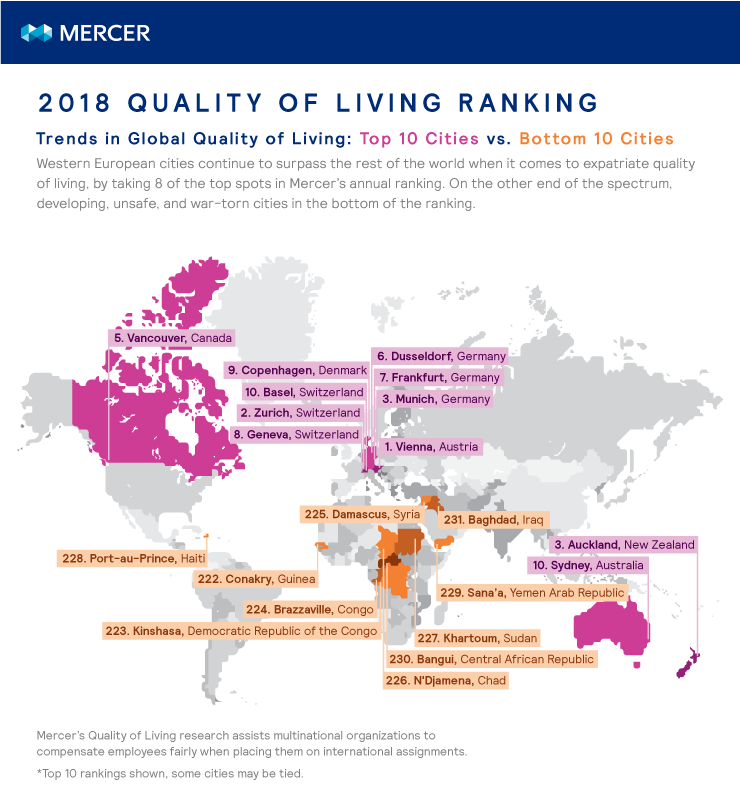 Learning from the strengths and weaknesses of the cities in Mercer’s survey could provide a blueprint for finding talent in an increasingly international world. 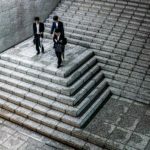 “Attracting and retaining the right talent is set to be one of the key challenges for businesses over the next five years,” said Ilya Bonic, senior partner and president of Mercer’s Career business.